School Lunch in Japan - It"s Not Just About Eating! Lunch takes on a different nature when treated as an education period, rather than a recreational one. No other organization was able or willing to take on the job. 呈现takes on a new appearance or quality, it develops that appearance or quality. The United States and Japan couldn"t be more different when it comes to school lunch programs. 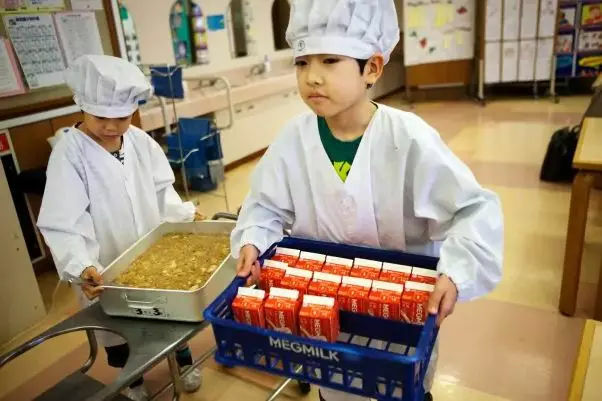 While the U.S. is considering cutting funding to school food programs for underprivileged kids, saying there"s insufficient evidence that feeding kids improves academic results, Japan places a high priority on feeding its schoolchildren healthy, homemade meals on a daily basis. It"s "on a daily basis." The "basis" is the bottom or foundation of something, and we always use "on" with it, never "in." Some other phrases include "on a regular basis" and "on what basis." An article in The Atlantic"s City Lab blog, titled “Japan"s school lunch program puts others to shame,” explores how and why this nation-wide program has been so successful. More than 10 million elementary and secondary school students in 94 percent of the country"s schools are fed through this program, and the food they eat is a far cry from the greasy, reheated cafeteria food that features prominently at American schools. This flat is a far cry from the house they had before. The Japanese meals are prepared daily from scratch by a team of cooks who work in the school"s kitchen. Often they use vegetables grown on school property that are planted and tended by classes. From an early age, the kids get used to eating healthy, well-balanced meals that would appeal to many adults. He built the shed from scratch. He carefully tended his sunflower plants. What really sets Japan apart, however, is the fact that it views lunch time as an educational period, not a recreational one. Lunch is a time for teaching kids important skills about serving food, table etiquette, and cleaning up – the polar opposite of the notoriously wild, uncontrolled, and messy lunch hour in U.S. schools that must be every janitor"s nightmare. The video illustrates shokuiki wonderfully. You see the children taking turns picking up the food cart in the kitchen, chanting a delightful “thank you” to the cooks who prepared it. They wash their hands, don proper serving outfits (smocks, hair nets, and face masks), and dole out the food to hungry, receptive classmates – roasted fish with pear sauce, mashed potatoes, vegetable soup, bread and milk. Nobody appears to complain about the food. Shokuiku (食育) is the Japanese term for "food education". The law defines it as the "acquisition of knowledge about food and nutrition, as well as the ability to make appropriate decisions through practical experience with food, with the aim of developing people"s ability to live on a healthy diet". He donned his cloak and gloves. 表示“发放，分发（钱、食物等）；（给多人）提供（建议）”，英文解释为“to give something such as money, food, advice etc to more than one person”举个?? She was doling out candies to all the kids. The teacher eats with the students, demonstrating good table manners and leading a discussion about the food"s origins. In the video, he focuses on the mashed potatoes, which come from the school garden. He tells the class, “You will plant these in March and eat them for lunch in July.” At other times, the discussion may veer into Japanese food history or culture. After all, this is lesson time, too. Our talk soon veered onto the subject of money. All of the students come prepared for lunch with reusable chopsticks, a cloth placemat and napkin, a cup, and a toothbrush.